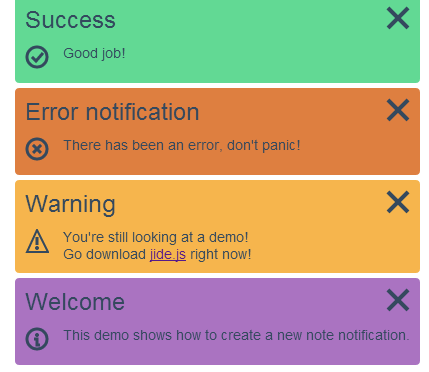 Today we’ll create a number of controls that allow you to add notifications (think of Growl) to your website. the NotificationArea will be an area on the screen where the notifications should be displayed. The type of the notification. We’ll support info, warning, error and success by default. The content that should be displayed in the notification. An icon that should be displayed next to the content. A boolean property that specifies whether or not the notification can be closed by the user. An integer that describes how long the notification should be visible before it disappears automatically. Setting it to 0 means that the user has to close it manually. The default setting will keep the notification area where it is. Displays the area at the top left corner of the page. Displays the area at the top right corner of the page. Displays the area at the bottom right corner of the page. Displays the area at the bottom left corner of the page. use nice default icons, we’ll also use a NotificationIcon object that loads some SVG icons from a file. Let’s start with the NotificationArea. // Notification controls that are children of this control. // This takes advantage of the event bubbling in jide.js controls. // Add an enum for the supported edge locations. One feature that we’re using here is the ability of jide.js controls to fire bubbling DOM events, i.e. they traverse the DOM tree until their propagation is stopped. Thus, we just listen for the notification:closed event that is fired by notifications whenever they are closed. // this is the event that the NotificationArea is listening for! Okay, as you can see this one is pretty simple, too. Whenever the control is closed, we fire the notification:closed event. At this point, we’ve already created both controls, all we need is some templates so that jide.js knows how to render these controls. The inline SVG contains our close icon, that’s why we’ve added an event listener to it. Everything else about this template is probably old news for you. As you can see, it contains a bunch of useful methods to help you create new notifications. This notification informs you of something. ‘You’re still looking at a demo! As always, the control is available in the jidejs-extra repository.